The Fit Over style from Wales Apparatus is a durable plastic frame with side shields and adjustable arms. 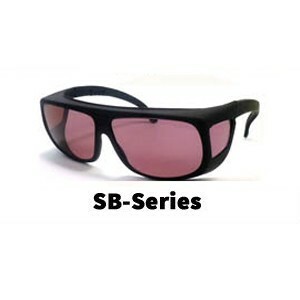 Scratch resistant polycarbonate lenses offer Sodium Flare and UV protection, similar to glass Didymium or ACE lenses. Great to use as a standard frame or as a fit over for existing glasses. Lightweight (39grams) and very comfortable. Perfect for kiln work! The distance between arms (measured at the glasses) is approx. 14cm. We know from experience that these glasses fit well on rather slim faces. People with rather wide faces and/or bigger reading glasses might find them too tight. In this case we recommend the GB-P2-33-BK by Phillips.